September, 20, 2018 - OMV has been exploring the potential of used plastics since 2011. In 2013 the first test facility started up in the Schwechat Refinery with a processing capacity of around 5 kg of used plastics per hour. The next-level test facility – with a processing capacity of up to 100 kg per hour – started operations in 2018 and produces 100 liters of synthetic crude per hour. This crude is then subjected to further processing in the Schwechat Refinery to become fuel or base materials for the plastics industry – creating a resource-friendly, circular economy. Manfred Leitner, OMV Executive Board member said: “ This technology allows us to use a barrel of oil multiple times. This means that less plastic is incinerated and greenhouse gases are reduced. The ReOil method thereby contributes to the OMV sustainability goals related to CO2 efficiency”. OMV invested around EUR 10 mn in the project as a whole, with the Austrian Research Promotion Agency (FFG) subsidizing 10% of the costs. "By continuously investing in the future, OMV's Schwechat refinery has been able to succeed for 60 years now. The opening of the innovative ReOil plant will allow OMV to continue along this successful path in addition to strengthening Austria as a business and investment location”, said Margarete Schramböck, Austria’s Minister of Economic Affairs. OMV claims that its recycling process involves thermal cracking at temperatures exceeding 300 degrees Celsius, a refining technology under which medium and long-chain hydrocarbons are cracked into shorter-chain hydrocarbons. 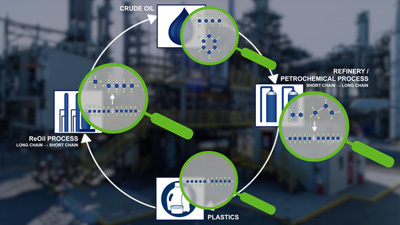 This means that this circular economy is also based on a circular technology: short-chain crude oil is turned into long-chain plastics which are then turned back into short-chain crude by means of the ReOil method. OMV holds the patent for this process in Europe, the USA, Russia, Australia, Japan, India, China and many other countries. With this innovative research project, OMV is contributing to the Sustainable Development Goals as laid out by the UN General Assembly in 2015. The recycling method has already been fully incorporated into the processes in the refinery and the research team has already started on its plans for the next-level plant. With Group sales of EUR 20 bn and a workforce of around 20,700 employees in 2017, OMV Aktiengesellschaft is one of Austria’s largest listed industrial companies. In Upstream, OMV has a strong base in Romania and Austria and a balanced international portfolio, with the North Sea, the Middle East & Africa and Russia as further core regions. 2017 daily production stood at approximately 348,000 boe/d. In Downstream, OMV operates three refineries with a total annual processing capacity of 17.8 mn tons and more than 2,000 filling stations in ten countries as of year-end 2017. OMV runs gas storage facilities in Austria as well as in Germany; its subsidiary Gas Connect Austria GmbH operates a gas pipeline network in Austria. In 2017, gas sales volumes amounted to 113 TWh.